Well I have to admit I have had a time finding just the right thing to go above this bed. Should we go down memory lane? Why not? Here is where we were in the beginning. Then I began to move in a more neutral direction with the bed. Can you see it? The lamps changed and we got a new bed. Here I have an original oil painting that I tried here. 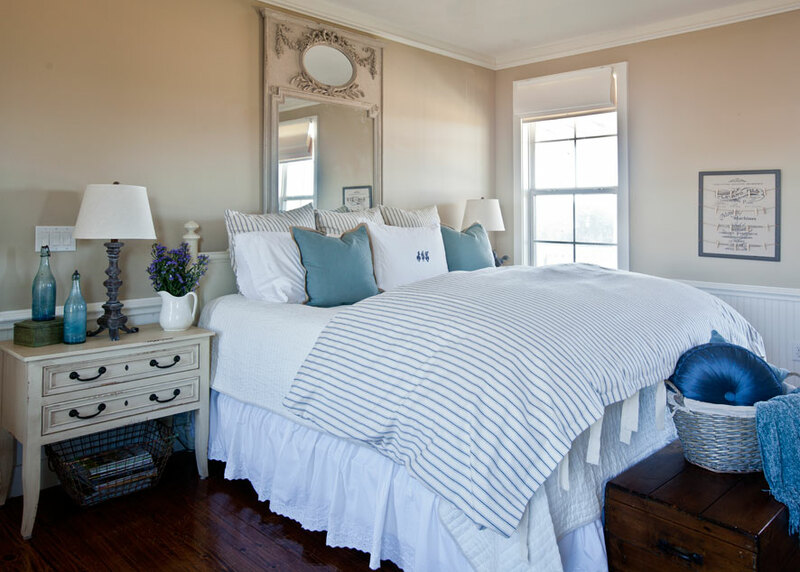 Finally we got new blue French ticking bedding, new lamps, and I tried a natural look with a basket on the wall. Then came the tin ceiling tile. I added a small sunburst mirror as a focal point. Then I switched it out for a larger mirror. 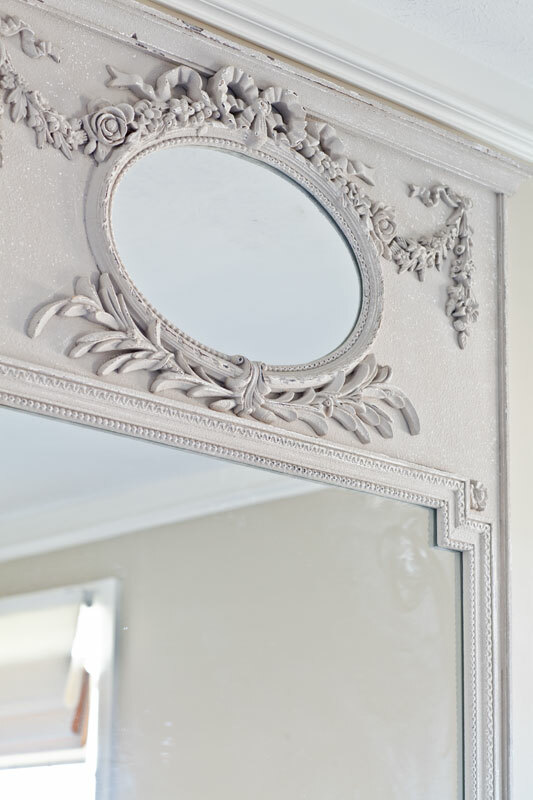 It’s a lovely mirror, but I thought the wall needed something and I felt I needed a longer bed skirt. More to come on Friday!!! Interesting to see all the changes. Not sure that mirror is the right piece either. Maybe instead of hanging something above the bed you should try building up the headboard. Just a thought. 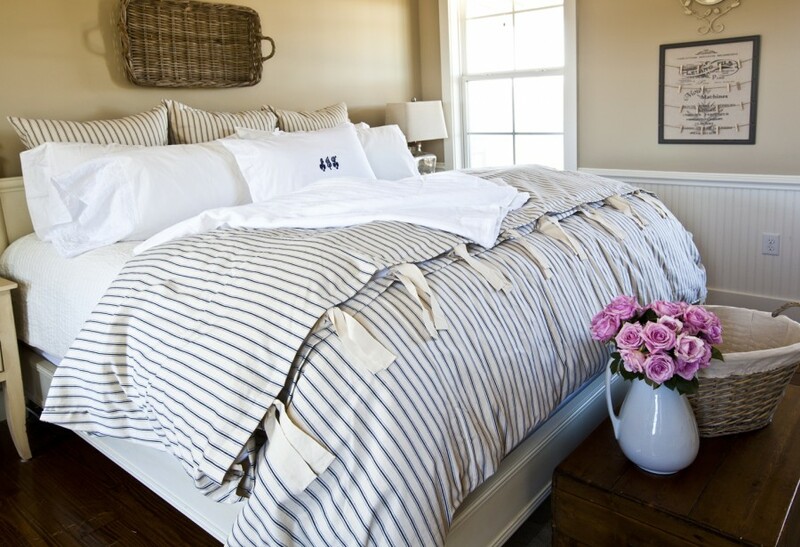 I love the ticking stripe bedding. I agree with this comment. 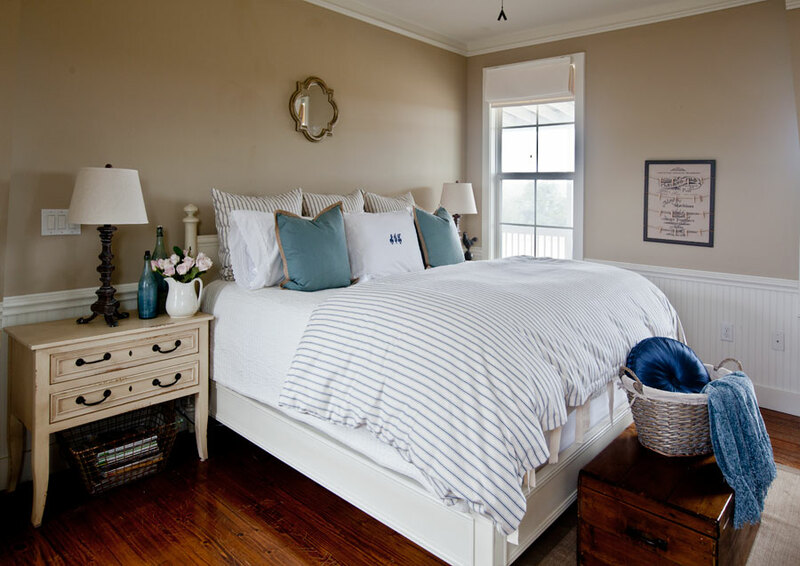 Love the bed, including the dust ruffle that doesn’t break on the floor – it looks fine as it is. The new mirror and other items, such as the tiles, are too tall and are a distraction. The taller headboard is a good idea as is something rectangular whose width is more in proportion with the width of the headboard. Your dissatisfaction with everything tells you that you haven’t found the right thing yet. You will find it and it’ll be great. Is that the mirror from your master? Love it the best. Hope you have some lovely little French sconces to go in either side….maybe? Love the mirror and the bedding! Gorgeous! 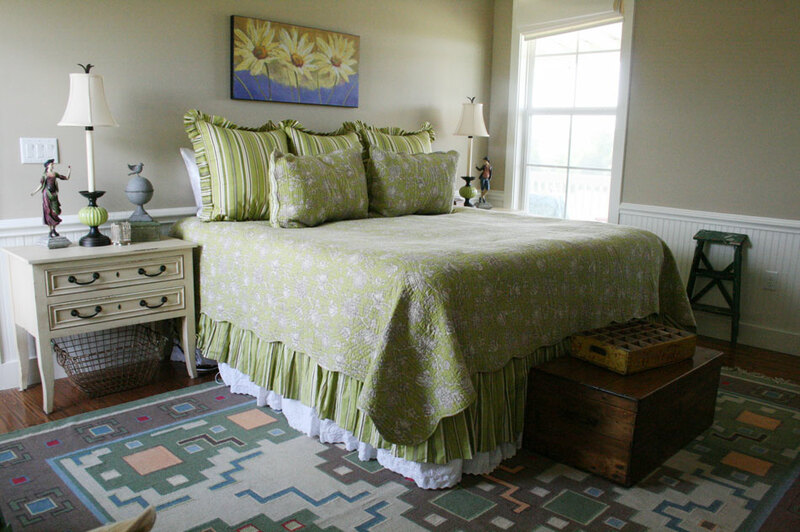 Well the first bedding is my favorite, green with two skirts but with the glass lamps too. I love the sunflower painting, makes it feel sunny and size appropriate. Thanks for sharing all of your changes, it’s fun to see the difference. So many great looks….the last is my favorite and the look I am going for! Thank you so much for your ideas!! Love that mirror – and the night table. Can’t wait to see what you do next (hope you keep the mirror). What a tease! Ticking stripes make my heart beat a little faster. I LOVE the bedding! And seeing the transformation in photos is fun, too. I am always rearranging and moving things from one place/room to another. Drives my husband crazy, haha! I appreciate your need to keep things moving around and changing accessories…I do this as well and you have given me permission to be creative. 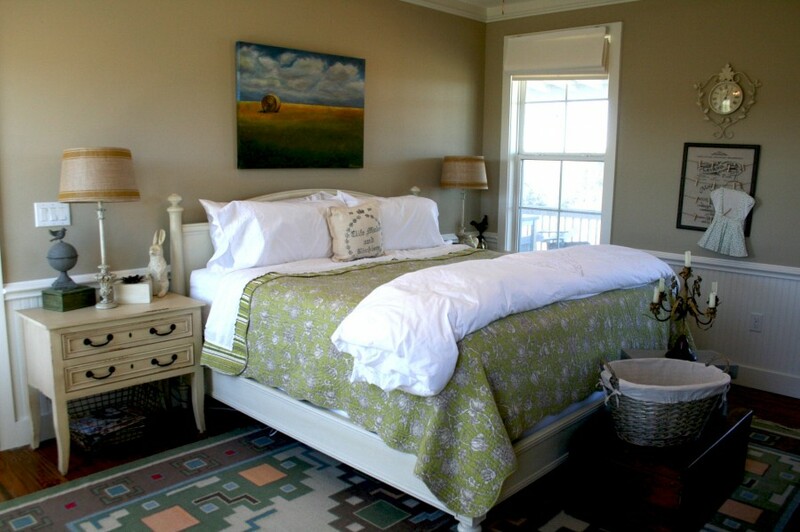 I like the simple basket above the bed the best, it appears to be the perfect size in scale to the bed and surroundings. 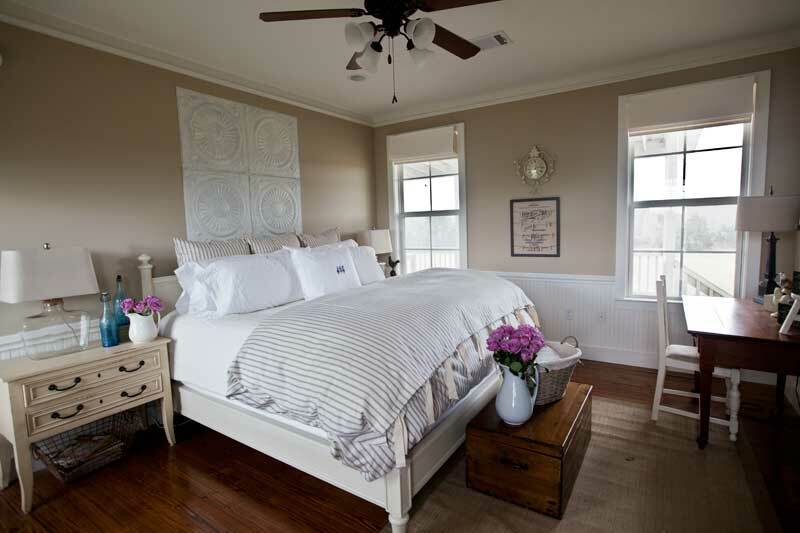 Love the ticking on the bed too.